When Reliance Jio provided free calling, dirt cheap internet, and notched up 120 million users, it was only getting started. 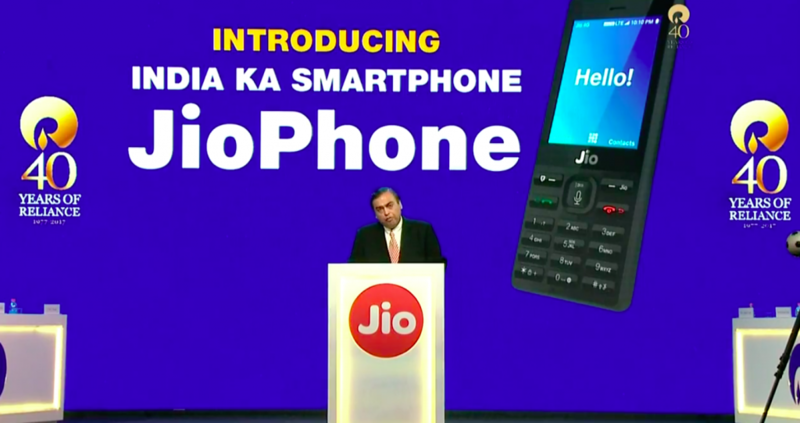 Jio has just launched the JioPhone, a 4G VoLTE phone that will cater to the India’s 50 crore feature phone users. Reliance says the phone is made in India and made for India, will help millions of Indian users to leapfrog into 4G technology. “Data is the oxygen of digital life, and no Indian should suffer from data scarcity,” said Reliance CEO Mukesh Ambani while announcing the phone. The phone looks like a sturdy feature phone, but packs in some impressive features. It has a 2.4-inch QVGA screen, support for a microSD card and a rear camera. True to its Indian roots, it supports 22 languages. It also seems to support voice commands — during a demo, Reliance showed you could simply speak into the phone to perform basic tasks, such as sending messages, or looking up information, such as asking when Ganesh Chaturthi is. It also integrates with Jio apps, and can play trailers and music. Going forward, the phone can also support NFC payments. And like with Jio’s original offering, the rates are something competitors will find it hard to compete with. For Rs. 153 a month, Jio will offer free voice calls and sms, and unlimited data services. Jio truly understands its market — for people who’re unable to afford Rs. 153 at one go, Jio has sachet packs for 2 days priced at Rs. 24 for two days, and Rs. 54 per week. As for the phone itself, Reliance says it is “free”. Reliance says it’ll charge a Rs. 1,500 security deposit for users who want to buy a phone, but users can return the phone in three years and be eligible for a full refund. Technically, users can use the phone for no cost for three years, but Reliance will hope that their experience will make them stay on with the service. To say that Jio’s moves are a masterstroke is an understatement. Jio had earlier made rapid inroads into India’s smartphone market with its dirt-cheap plans, notching up 72 million subscribers within the first six months of its launch. It had caused other players to scramble to cut costs, and Airtel, Idea and Reliance Communications had seen their profits dip as a result. Jio’s growth, though, was slowing, hampered in part by the total number of available 4G handsets. By providing “free” phones, Reliance will hope that existing feature phone customers will find it easier to switch to 4G. Even with the advent of 3G and 4G technologies, 2G remains the most popular choice for Indian customers, with 167 million subscribers. It’s trailed by 130 million 3G subscribers, and just 17 million 4G customers. Jio plans to wean away existing feature phone users with rates that competitors have found hard to keep up with. JioPhone will be available for pre-booking on 15th August, which Ambani dubbed India’s digital independence day. With the JioPhone, Reliance could make inroads into India’s telecom heartland like no other company before it. Airtel, Idea and Reliance Communications were already struggling against Jio’s onslaught — the JioPhone will likely give them more sleepless nights.